Tibial and fibular collateral ligaments. Anterior and posterior cruciate ligaments. It’s a thin fibrous sac which encircles the joint. It’s deficient anteriorly, where it’s replaced by the patella, quadriceps femoris, medial and lateral patellar retinacula, and ligamentum patellae. It’s connected about 1/2 to 1 cm beyond the articular margins with the following 3 special features. Anteriorly it’s deficient in the middle where it’s pierced by the suprapatellar bursa. Posteriorly it’s connected to the intercondylar line. Laterally it encloses the origin of popliteus. Anteriorly it descends along the margins of the condyles to tibial tuberosity, where it’s deficient for the connection of the ligamentum patellae. Posteriorly it presents a gap behind the lateral condyle for the passage of the tendon of popliteus muscle. The synovial membrane lines the inner aspect of the fibrous capsule and the portions of the bones enclosed inside it but stops at the periphery of the articular cartilages the medial and lateral menisci. In front above the patella, it’s prolonged as suprapatellar bursa, and below the patella, it covers the deep surface of the infrapatellar pad of fat, which divides it from the ligamentum patellae. The apex of suprapatellar bursa is connected to the articularis genu muscle. A median triangular fold of the synovial membrane termed infrapatellar fold goes upward and backwards from the fat pad to the intercondylar fossa of the femur. The lateral margins of the infrapatellar synovial fold are free and create the alar folds, which include the fibrofatty tissue. From the posterior aspect of the fibrous capsule, the synovial membrane projects forwards in the intercondylar region as cul de sac to envelope the sides of both cruciate ligaments and in front of the anterior cruciate ligament. It’s really the tendon of insertion of quadriceps femoris, which stretches from the apex of the patella to the upper part of the tibial tuberosity. Ligamentum patellae is about 7.5 cm long and 2.5 cm broad. 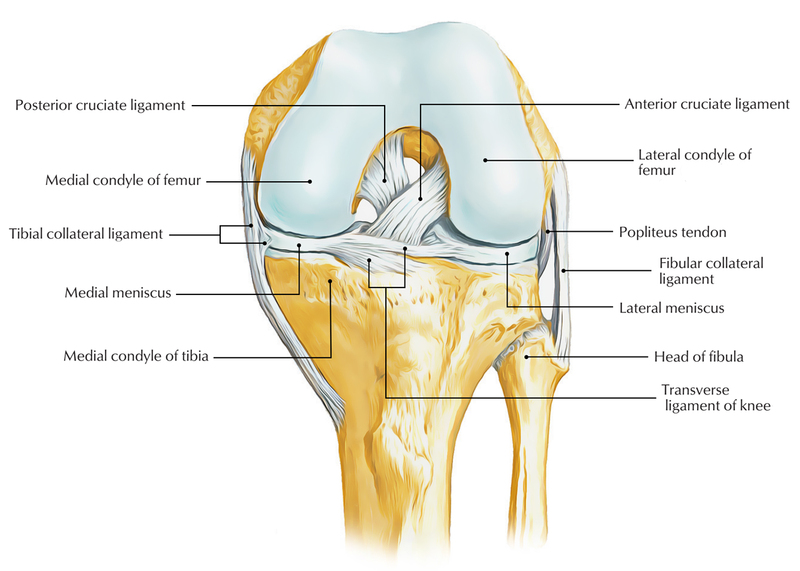 It’s connected above to the margins and rough posterior surface of the apex of patella, and below it’s connected to the smooth, upper part of tibial tuberosity. It’s related to the subcutaneous and deep infrapatellar bursae, and infrapatellar pad of fat. It’s a powerful, long (about 10 cm), thick, and flat band of fibrous tissue. It is composed of superficial and deep parts. Both parts are connected above to the medial epicondyle of the femur just below the adductor tubercle. The superficial part of the ligament is long and connected below to the upper part of the medial border and adjoining posterior part of the medial outermost layer of the tibia. It covers the inferior medial genicular nerve and vessels, and anterior part of the tendon of semimembranosus. The tendons of sartorius, gracilis, and semitendinosus cross its lower part superficially. The deep part of the ligament is short and mixes together with the fibrous capsule, and with the peripheral margin of the medial meniscus. It’s connected below to the medial condyle of the tibia above the groove for the tendon of semimembranosus. It’s short (about 5 cm long) and cord-like ligament. Above it’s connected to the lateral epicondyle of the femur just above the popliteal groove. Below it’s covered by the tendon of biceps femoris and connected to the head of fibula before its apex. Its deep surface isn’t adherent to the fibrous capsule. It’s divided from the capsule and lateral meniscus by the tendon of popliteus. Its lower part is divided from the capsule by the inferior lateral genicular nerve and vessels. Morphologically, the medial collateral ligament represents the degenerated tendon of insertion of the ischial head of the adductor magnus, and fibular ligament represents the degenerated tendon of the peroneus longus. 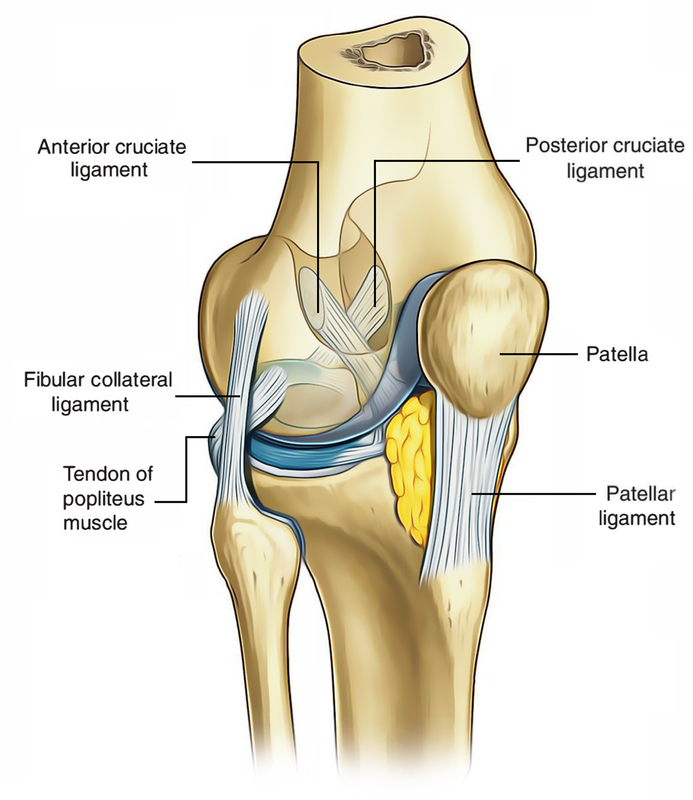 The medial collateral ligament is a lot thicker and more powerful in relation to the lateral collateral ligament since the knee joint gaps more on the medial side, for this reason the requirement for more powerful stabilization on such side. All these are 2 thick, strong fibrous bands, which serve as direct bonds of union between the femur and tibia. They may be found within the knee joint. They represent the collateral ligaments of the archaic femorotibial joints. They keep anteroposterior stability of the knee joint. They can be termed anterior and posterior according to their site of connection to the tibia. The cruciate ligaments are intracapsular but extrasynovial. The ligaments cross every other like the letter “X” thus the name cruciate. 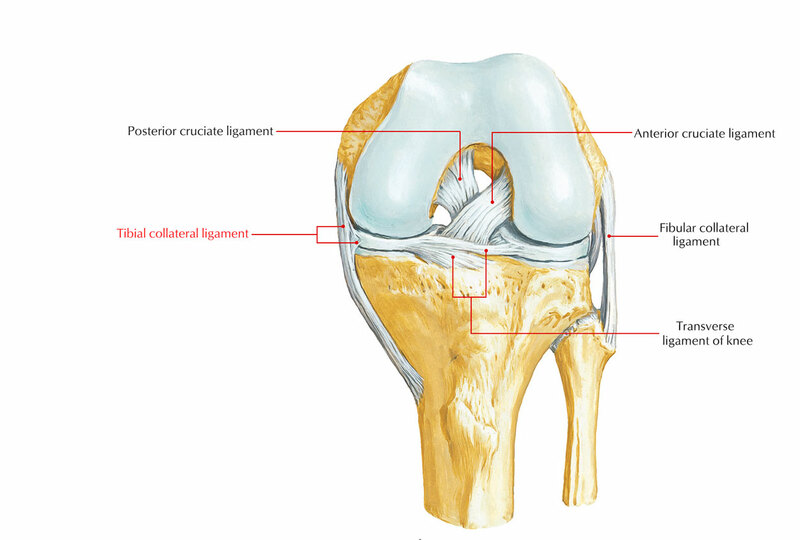 The anterior cruciate ligament is connected below to the anterior part of the intercondylar area of the tibia. It runs upward, backward, and laterally and is connected to theposterior part of the medial surface of the lateral condyle of femur. It’s tight during extension of the knee and prevents the posterior dislocation of femur on tibia and anterior dislocation of tibia on femur. The posterior cruciate ligament is connected below to the posterior part of the intercondylar area of the tibia. It runs upward, forwards, and medially and is connected to the anterior part of the lateral surface of the medial condyle of the femur. It’s tight during flexion of the knee and prevents the anterior dislocation of femur on tibia and posterior dislocation of tibia on femur. Both of these crescent shaped intra-articular discs are created from fibrocartilage. They’ve thick peripheral border and thin inner border. They deepen the articular surfaces of the condyles of tibia, and somewhat split the joint cavity into the upper (meniscofemoral) and lower (meniscotibial) compartments. Flexion and extension of the knee take place in the upper compartment, while the rotation of the knee takes place in the lower compartment. Every meniscus has: (a) 2 ends (anterior and posterior), that are connected to tibia; 2 edges- the thick outer border is fixed to the fibrous capsule and the thin inner border that is free; and (b) 2 thin surfaces- the upper surface is concave for the femur; the lower surface is flat for the peripheral 2/3rd of tibial condyles. It’s almost semilunar in shape and wider behind than in front. It presents anterior posterior ends or horns, that are connected to the intercondylar area of the tibia. It’s adherent to the deep part of tibial collateral ligament. It’s securely connected to the tibial plateau by coronary ligaments. It’s almost circular in shape with more or less a uniform width. It also presents anterior and posterior horns, that are also connected to the intercondylar area of the tibia. The posterior horn of the lateral meniscus is connected to the medial condyle of femur by the anterior and posterior meniscofemoral ligaments. The anterior meniscofemoral ligament (ligament of Humphrey) enters in front of the posterior cruciate ligament while the posterior meniscofemoral ligament (ligament of Wrisberg) enters behind the posterior cruciate ligament. These ligaments play an essential part in controlling the movements of lateral meniscus during the extension of the knee joint. The lateral meniscus is connected to the medial part of the tendon of popliteus and therefore the freedom of its posterior horn is restrained by the popliteus and 2 meniscofemoral ligaments. C-shaped/semilunar in shape. “O”-shaped/circular in shape. Attached to the medial collateral ligament. Attached to the tendon popliteus muscle. The menisci raise the concavities of the tibial condyles for better congruence together with the femoral condyles. They serve as swabs to lubricate the joint cavity. They serve as shock absorber to safeguard the articular cartilage during weight transmission. They adjust to the changing curvatures of the various parts of the femoral condyles. Meniscal tears: The injuries to menisci are generally caused by the turning strains in a somewhat bent knee, as in kicking a football. The meniscus could get divided from the capsule, or it might be torn longitudinally (bucket-handle tear) or transversely. The medial meniscus is more susceptible to injury in relation to the lateral due to its solid fixity to tibial collateral ligament, and greater trip during the rotatory movements. The lateral meniscus is shielded by the popliteus muscle because its medial fibres pulls the posterior horn of meniscus backwards, so that it’s not squashed between the articular surfaces. Pain on the medial rotation of tibia on the femur signifies injury of the medial meniscus; while pain on the lateral rotation of tibia on the femur signals injury of the lateral meniscus. (a) middle genicular nerve, (b) middle genicular vessels, and (c) posterior section of the obturator nerve. It’s a Y-shaped fibrous band. The stalk of the group is connected to the styloid process of the fibula. The large posterior or limb of the band arches over the tendon of popliteus and is connected to the posterior border of the intercondylar area of the tibia. The small anterior limb (frequently deficient) enters deep to the fibular collateral ligament and is connected to the lateral condyle of the femur. It extends transversely and attaches the anterior ends of the medial and lateral menisci. It’s present only in about 40% of the people. They’re parts of the fibrous capsule, which supply connection to the peripheral margins of the medial and lateral menisci to the tibia. How many ligaments are there in knee joint? It’s a thin fibrous sac which encircles the knee joint. Force applied to the lateral aspect of a fixed knee will most likely damage which ligament? Which meniscus is C- shaped and more prone to injury? 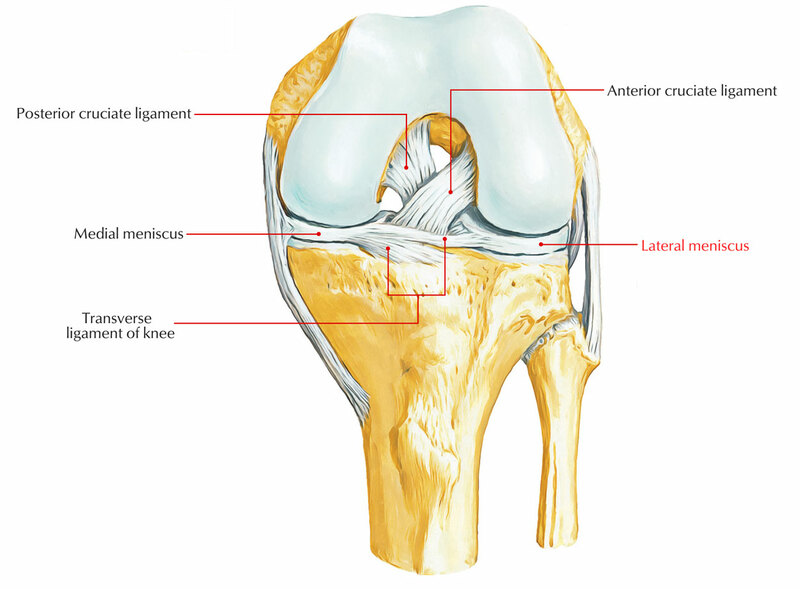 Which ligament of the knee is attached to the medial meniscus? Which movement is the cause of posterior cruciate ligament rupture? Which ligament of knee joint is Y-shaped fibrous band?